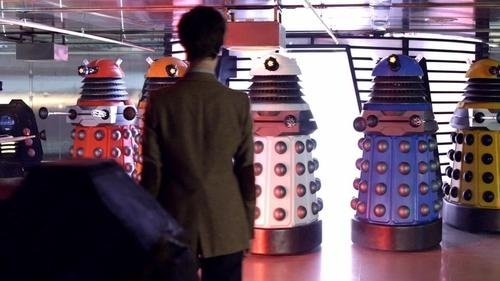 Last night American viewers saw Victory of the Daleks (written by Mark Gatiss), the first appearance of the Daleks since Steven Moffat took over Doctor Who. This post will include major spoilers for the most recent episode to air on BBC America with minimal information on subsequent episodes which have aired on the BBC. The Daleks are so heavily identified with the series that it was almost mandatory to have such a story, but recent Dalek stories left little room for further development. When the show was rebooted we had a new back story of the Daleks being destroyed in the Time War. Since then we’ve had episodes in which a few Daleks survived and tried to rebuild but were stopped by The Doctor. This episode served to reboot the Daleks as this time The Doctor failed to destroy the Daleks. This is for the better (at least in terms of writing stories). There is a limit to the number of times we can have The Doctor appear to have destroyed the Daleks only to have them return once again. The Daleks were created as the Nazis of the universe, both the ultimate killing machine and a race which thinks all others are inferior beings which deserve to be exterminated. 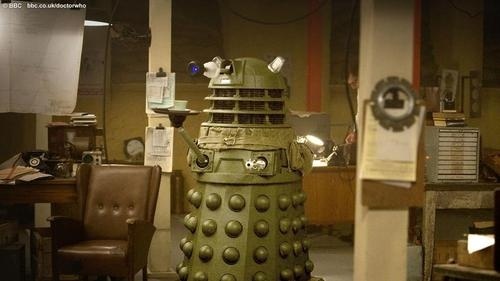 Therefore it is fitting that we had a Dalek episode take place during World War II. The twist is that the Daleks appeared to be on the side of the British. While the Daleks are best known for their cries for extermination, many of the best Dalek stories have involved them using trickery to gain what they needed. The show began with highly entertaining scenes of Daleks pretending to be the creation of a human scientist to help the British. They performed functions from shooting down incoming bombs to serving tea. This all turned out to be a trick to get The Doctor to testify that these genetically impure Daleks are Daleks so that the Progenitor would reactivate and provide access to pure Dalek DNA to create a new race of Daleks. The new improved Daleks even come in different colors. Most likely the redesign, like the redesign of the interior of the Tardis, was to improve the look on HD television sets, along with providing new action figures to sell. The Daleks succeeded with their trickery, but The Doctor used some trickery of his own to limit the Dalek victory. The show also featured excellent space battles as Spitfires were launched to attack the Dalek ship. Besides rebooting the Daleks, leaving them free to return in future episodes without having to contrive reasons why a few survived the Time War, the episode provided what I believe is a major development in the ongoing story of the crack in time beginning with the first episode of the season. The crack was seen again, and Amy had no recollection of The Daleks invading earth in her time. Besides showing that something is happening with time, this change might also have its benefits if it continues. Earth in the Davies era had become far too accustomed to contact with aliens, making it a far different place from the real earth. Looking beyond all the holes in the plot, which is necessary to enjoy Doctor Who, I have two complaints. The story began at the end of the previous week’s episode with Winston Churchill calling The Doctor on a telephone. Come on. Secondly, we know that The Doctor travels through time, the Daleks travel through time, and the Time Lords travel through time. If at one point in time there was a Time War which ended the Daleks and the Time Lords, why should The Doctor never be expected to encounter them again during his travels through time? If The Doctor went to World War II England he theoretically should have been able to run into Daleks from before the Time War.Similarly he should be able to meet a Time Lord who had not yet reached the point of the Time War. This certainly cannot be explained by arguing that their time lines cannot cross. The next two episodes involve the return of River Song, along with the Weeping Angels. We already know from The Doctor’s previous encounter with River that they have a habit of running into each other in different orders. Perhaps the time bubble used at the conclusion of the Time War provides an argument which is no worse than many of the other aspects of the show we just must accept.